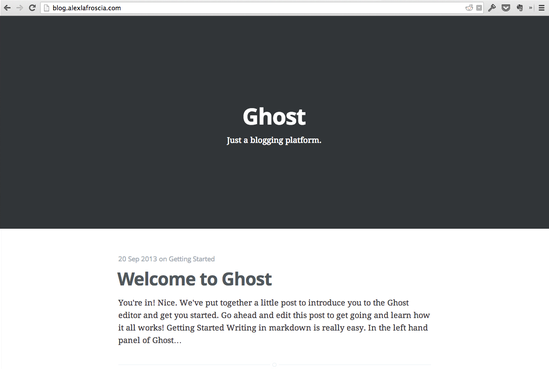 In April 2013, John O'Nolan, no newcomer to the field of blog-making, launched a Kickstarter for a new kind of blog called Ghost, which could radically simplify writing and maintaining a blog. Here, we'll walk through all of the steps to get Ghost set up and running on a DigitalOcean VPS. This tutorial will assume you already have a copy of Ghost on your local computer. Since it's only available to Kickstarter backers right now, you should have been sent a link to the site where you can download it. This tutorial will assume that you've already set up a VPS. We'll be using Ubuntu 12.04, but you should be fine with whatever you'd like. If you need help with this part, this tutorial will get you started. This tutorial will assume that you've already pointed a domain at your VPS. This tutorial should help you out with that part, if you're unsure of how to do that. Once that is complete, we need to get npm installed. Running the following commands will install some dependancies for Node, add its repository to apt-get, and then install nodejs. Note: You shouldn't need to run the commands with sudo because you're probably logged in as root, but if you're deviating from this tutorial and are logged in as another user, remember that you'll probably need sudo. Now, if you run npm at the command line, you should see some help information printed out. If that's all good, you're ready to install Ghost! The next thing to do will be getting your copy of Ghost onto the remote server. Please note that this step is only necessary for now, while Ghost is in beta. Once it is available to the public, it will be installable through npm (and this tutorial will likely be updated to reflect that). This will copy all of the contents of the ghost-0.3 folder to the home folder of the root user on the server. If that is the case, congratulations! Ghost is up and running on your server. Stop the process with Control-C and move onto the next steps to complete the configuration. The next step is to install and configure nginx. Nginx (pronounced "engine-x") is "a free, open-source, high-performance HTTP server and reverse proxy". Basically, it will allow connections from the outside on port 80 to connect through to the port that Ghost is running on, so that people can see your blog. This will listen for traffic incoming on port 80 and pass the requests along to Ghost, provided they are connecting to the domain that you provide. Start up the server again (use the code from the end of Step 2) and visit your domain. If you see Ghost, you're good to go! # description "An Upstart task to make sure that my Ghost server is always running"
# author "Your Name Here"
This should ensure that Ghost gets started whenever your server does, and allow you to easily control Ghost using service ghost start, service ghost stop, and service ghost restart.